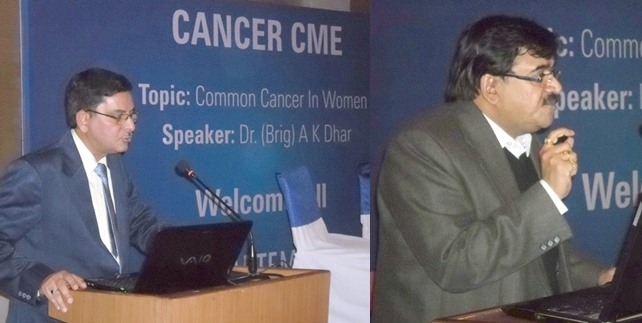 CME on Common Cancers in women was organized by Artemis Health Institute,Gurgaon at Radission Hotel, Dwarka. The CME started with the welcome address by Mr. Praveen Kharbanda-Marketing Executive of Artemis Group of Hospitals. Dr.(Brig.) A.K.Dhar,VSM-M.D. fellowship Medical Oncology (TMH, Mumbai) BMT Physician, Director-Medical Oncology & Bone Marrow Transplant shared his experiences on the symptoms, causes , prevention and treatment details of cancer disease in women. In the second session of CME, Dr. Alok Gupta-M.B.B.S. M.S. (Surgery), M.Ch. (Neurosurgery), Head-Neurosurgery also gave As,way detailed presentation on Neurosurgery. Dr. Prakash Lal Chandani-President-IMA, Dwarka, Dr. Rajiv Bhatnagar-Secretary-IMA, Dwarka, Dr.C.M.Bhagat-Medical Director-Bhagat Hospital Private Limited, Dr. D.C.Deuri-Chief Medical Officer, Special Protection Protection Group Dispensary, Dwarka, Mr. Sanjoy Bhattacharya – Spokesperson, Artemis Health Institute,Gurgaon and around hundred doctors attended the said CME. In the end, Dr. Sunil Kumar Khetarpal – MBBS, PGDMLS, PGDHM, PGDMLE, MHA,-Medical Superintendent of Artemis Health Institute, Gurgaon paid the vote of thanks. A Great Man Born Out of Adversity !